Vitamin E, Selenium and Lysine are vital for optimum muscle function, particularly in performance horses. NAF Vitamin E Selenium Lysine contains the perfect quantities to support even the most strenuous exercise or competitions. Using a natural Selenium yeast, NAF's Vitamin E Selenium Lysine is a far safer and more stable compound, with better efficacy and results. Dextrose, Soya flour (heat treated), Brewers' yeast, White mineral oil. Below are some recent questions we've received regarding NAF Vitamin E Selenium Lysine for Horses, including answers from our team. 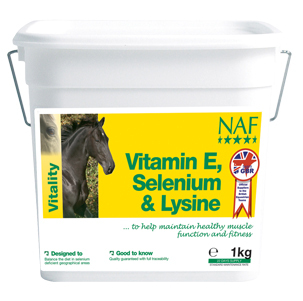 I can confirm that the Vitamin E and Selenium Plus with Lysine is suitable for competition under FEI rules.